Every year, without fail, when I ask my husband what he’d like to eat for Thanksgiving he has the same answer: dinner rolls. Not turkey, or stuffing, or any type of dessert. Just dinner rolls. I’m actually convinced I could microwave him a Hungry Man dinner and he’d be satisfied as long as I made dinner rolls from scratch. The truly obnoxious part is, he’s a fussy dinner roll person. I’m a Parker House girl, and for whatever reason, he turns his nose at them every single time I make them. Then, last year, out of protest, I bought dinner rolls in a can and he ate the entire batch! I was pretty astonished/ashamed/disgusted and threatened to never make homemade dinner rolls again. The threat only lasted about nine months. As we’ve been inching towards Thanksgiving and Christmas, I’ve been sucked into the excitement of planning and experimenting with eye-catching recipes I’ve found on other blogs and magazines. After my husband lost his mother last month, we then we decided we were going to order Thanksgiving dinner (we tried it last year, and it was perfect for 4 people!) and spend Christmas in New York City, all of the cooking and researching seemed to be for nothing. Then, my husband requested the inevitable: dinner rolls. While the rolls aren’t the prettiest rolls I’ve ever seen or made, they’re certainly the most versatile and even Mr. Roll snob loves them. I’ve made them four or five times, tweaking things here and there, and he has eaten the majority of them. It’s kind of a wonder he can still fit into his jeans. When I’ve made these the past couple of weeks, I’ve made them over two days, giving the yeast ample time to do its thing and rise to perfection. If your oven has the warming function, I recommend using it for the first rising, as it legitimately triples the dough in size and makes a truly pillow-like roll of deliciousness. After the first rise, plop the dough out on a lightly floured surface, shape it into a ball and cut it into half—then cut each half into at least 6 slices. If you want smaller rolls (and waist-friendly portions), cut more slices so you have lots of rolls. 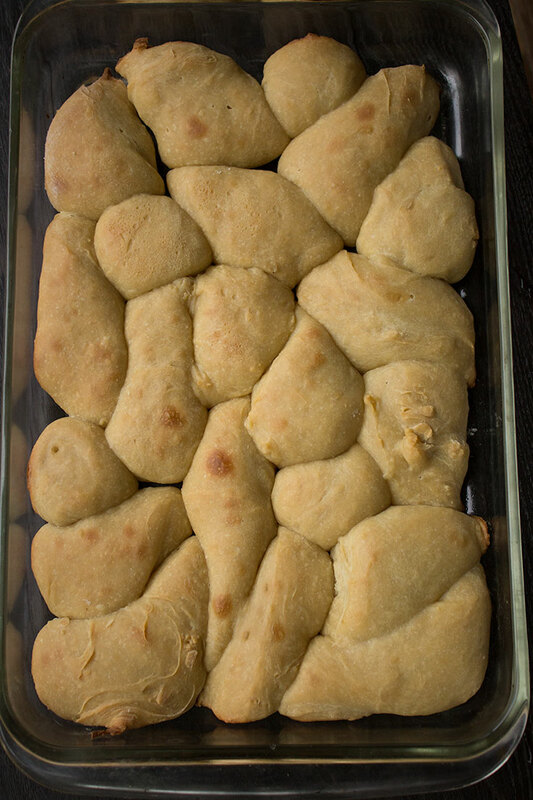 The rolls are baked in one casserole dish (or two if using smaller casserole dishes to bake them with staggered finishing times), placed together like a puzzle, and while they’re warm from the oven, pulled apart from one another. The plain ones are delicious with jam and butter, while the ones with herbs are the perfect vehicle for an on-the-go miniature sandwich stuffed with turkey (or ham), stuffing, cranberries, and gravy. If by some miracle, they’re just as delicious the next day after being lightly toasted in the toaster oven or reheated in the oven. If you’re looking for other Thanksgiving recipes, check out our savory mushroom turnovers, southwest inspired cornbread dressing, chocolate pumpkin cupcakes, and maple bourbon sweet potato mash for inspiration. Also, be sure and check out our 7 foolproof tips on stress-free hosting! 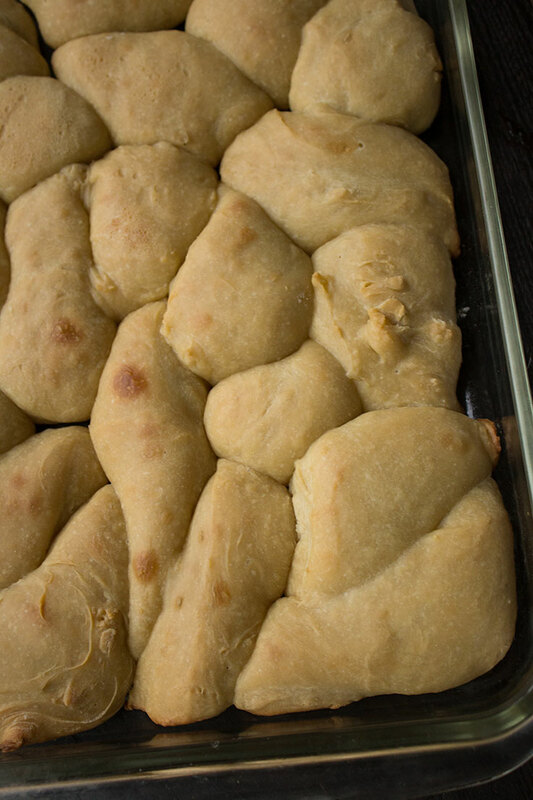 These rustic dinner rolls are SO easy to make and are loved by roll addicts everywhere. In the bowl of a stand mixer, add the yeast, water and a pinch of sugar and let stand until foamy, about 10 minutes. Add the milk, butter, eggs, and sugar and mix until just combined using the paddle attachment. Switch to the dough hook, and knead on low speed until a ball forms.Butter a large bowl. Scrape the dough into the bowl and place in a warm place, covering with a towel or plastic wrap until it's doubled in volume, about 2 hours. Preheat your oven to 350º. Grease a 9 by 13 baking dish (or two 8x8's). On a lightly floured workspace, knead the dough with floured hands and shape into a ball. Cut the dough in half and then cut into wedges, or whatever another shape you prefer. Re-cover the baking dish with a towel or plastic wrap, and allow to rise a second time, about 45 minutes.Bake the rolls for about 22 minutes, until golden brown. Remove from oven and allow to cool slightly. Serve warm with lots of butter. Note: if you want to add the fresh herbs, add them with the milk, butter and eggs. What's the one side dish your family requests every year for the holidays?